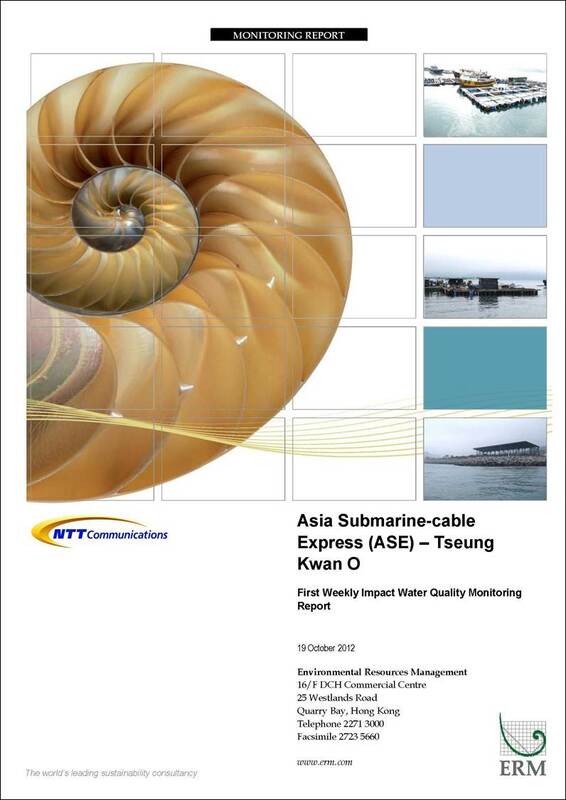 The submarine cable installation works for the Asia Submarine-cable Express (ASE) cable system were commenced on 8 October 2012. This is the First Weekly Impact Water Quality Monitoring Report presenting the impact water quality monitoring conducted during the period from 8 October 2012 to 14 October 2012 in accordance with the Monitoring and Audit Manual (EM&A Manual). During the reporting period, submarine cable laying works in Zone A and B were undertaken and had been largely completed by the end of the week. Seven monitoring events were scheduled in the reporting period in Zone A and Zone B. Monitoring events at Zone A and Zone B designated monitoring stations were generally performed on schedule. Exceedances of Action and Limit Levels were recorded during the reporting week. However, the exceedances were considered to reflect natural background fluctuation rather than to be caused by the Project. The submarine cable installation works will be conducted in Zone C and from Zone C eastward to the boundary Hong Kong marine waters in the coming week. Impact water quality monitoring will then be carried out in Zone C and cease once the cable installation barge moves out Zone C or no cable laying works are undertaken within Zone C.
This is the First Weekly Impact Water Quality Monitoring Report, which summarises the results of impact water quality monitoring as part of the EM&A programme during the reporting period from 8 October to 14 October 2012. 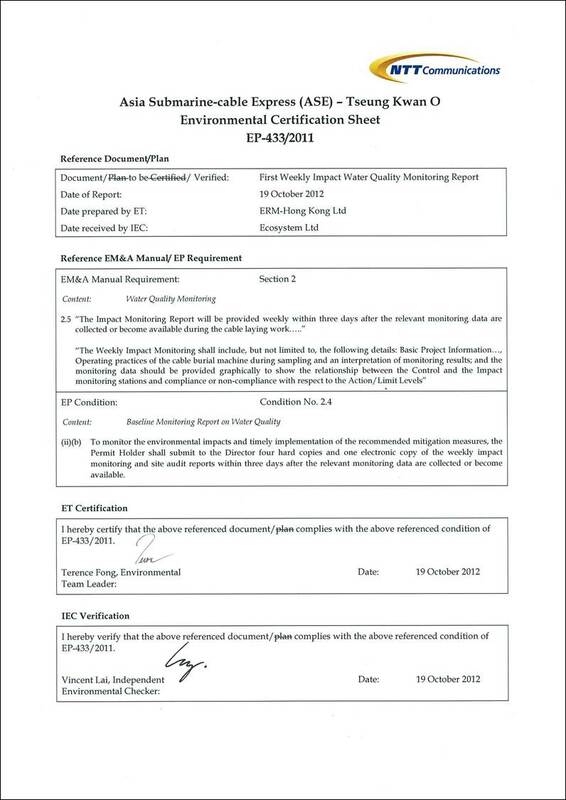 Pursuant to Condition 2.4 of the EP, an environmental monitoring and audit programme as set out in the Environmental Monitoring and Audit Manual (EM&A Manual) is required to be implemented. In accordance with Section 2 of the EM&A Manual, impact monitoring of marine water quality should be undertaken when the cable installation barge works in Zone A, Zone B and Zone C.
Impact monitoring started on 8 October 2012, when the cable laying works commenced in Zone A. During the reporting period, the impact monitoring was conducted on a daily basis as the cable laying works proceeded in Zone A and Zone B. This Report therefore presents the monitoring results from the monitoring stations in Zone A and Zone B. Cable laying works in Zone A and Zone B were undertaken during the reporting week from 8 October 2012 to 14 October 2012, and had been largely completed by the end of the week. In accordance with the EM&A Manual, during the installation of the cable in Zone A, water quality sampling was undertaken at the stations situated around the cable laying works in Zone A. The locations of the sampling stations within Zone A are shown in Figure 3.1. In accordance with the EM&A Manual, during the installation of the cable in Zone B, water quality sampling was undertaken at the stations situated around the cable laying works in Zone B. The locations of the sampling stations within Zone B are shown in Figure 3.2. In-situ data and SS data were collected during the cable installation works from 07:00 to 23:00 on a daily basis. The impact monitoring schedule for the reporting period is presented in Annex A. Impact monitoring at E7, E8, E9, F1, S1, S2, S3, G1, G2, G3 and C1 commenced when the cable installation barge works were within Zone A. The sampling works ceased once the cable barge was outside Zone A or no cable laying works were being undertaken within Zone A. Similarly, impact monitoring at C2, G3, G4, G7, B1, B2, B3, E1, E2, E6, E9 and F1 commenced when the cable installation barge works were within Zone B. The sampling works ceased once the cable barge was outside Zone B or no cable laying works were being undertaken within Zone B. Due to the weather conditions and travelling time between stations, in-situ and SS measurements were taken at the impact monitoring stations with approximately four-hour interval in Zone A and Zone B. The monitoring frequency and parameters for Impact Monitoring are summarised in Table 3.4. The Event and Action Plan for water quality monitoring which was stipulated in the EM&A Manual is presented in Table 3.7. A total of seven monitoring events were scheduled between 8 October and 14 October 2012. Monitoring events at all designated monitoring stations within Zone A and Zone B were generally performed on schedule. No major activities influencing the water quality were identified during the reporting period. Despite relatively stable water quality, exceedances of the Action and Limit Levels were recorded during the reporting week except 12 Oct 2012. A summary of stations where exceedances were recorded is presented in Table 4.1. Exceedances with detailed information of location and time were presented in Annex C.
Exceedances of the Action and Limit Levels in bottom DO were recorded at Stations E9 and S3 in the 1st, 2nd and 3rd sampling rounds on 8 October 2012 (Table 4.2). According to the daily barge operation report, there were some maintenance and repair works carried out by the Contractor and the burial operation (ie jetting works) did not start until 17:00 of 08 October 2012. Jetting works were undertaken between 17:00 – 23:00 on the day. As stated above, jetting works for the Project were not being undertaken when the exceedances were recorded in the 1st and 2nd rounds of marine water quality monitoring (ie 09:00 – 15:04). Therefore, the exceedances of the Action/Limit levels at E9 and S3 in the first two rounds are considered as representing natural background fluctuations. The exceedances of the Action Level at S3 in the 3rd round of marine water quality monitoring is marginal in nature, with merely 0.02 mg/L lower than the corresponding Action Level value (ie 4.39 mg/L). When the sampling was carried out, the current direction was westward. Given the fact that the bottom DO value at Gradient Station G2 (4.78 mg/L), which is situated between the barge and S3, was within the Action Level, the exceedance measured at the S3 was unlikely to be caused by the jetting works but should be considered as an occasional case and representing natural background levels during the time of monitoring. Exceedances of the Action and Limit Levels in bottom DO were recorded at Stations S1, S2 and S3 in all four sampling rounds on 9 October 2012 (Table 4.3). According to the daily barge operation report, there were preparation and equipment maintenance works carried out by the Contractor before the burial operation (ie jetting works) resumed at 11:30. All marine works stopped at approximately 20:00 in the evening. The actual time of jetting works on 09 Oct 2012 was between 11:30 to 20:00. As stated above, jetting works were not being undertaken when the exceedances were recorded in the 1st round and late stage of the 4th round of marine water quality monitoring (ie in the periods of 07:00 – 10:55 and 20:00 – 23:05). Therefore, the exceedances of the Action/Limit levels at S1 in the 1st sampling round and S3 in the 4th round are considered as representing natural background fluctuations rather than a result of the cable installation works. Despite the Action Level exceedance at S1 in the 2nd sampling round, the bottom DO value (4.34 mg/L) was higher than that measured at the same station in the 1st round (4.28 mg/L) when jetting works had yet to start and was not expected to impose any impact. The bottom DO at S1 continued to increase and was found to be compliant with the water quality limit in the 3rd sampling round when jetting works resumed after 11:30 and were taking place at the time of sampling (11:40 - 11:55). Therefore the exceedance measured at the S1 in the 2nd round was unlikely to be caused by the jetting works but should be considered as representing natural background levels during the time of monitoring. The exceedance of the Action Level at S2 in the 3rd round of marine water quality monitoring is an occasional case that occurred only once among all four sampling rounds. The exceedance of the Action Level at S3 in the 3rd round is marginal in nature, with merely 0.03 mg/L lower than the corresponding Action Level value (ie 4.39 mg/L). When the sampling at S2 and S3 was carried out in the 3rd round, the current direction was westward. Given the fact that the bottom DO value at Gradient Station G2 (4.71 mg/L), which is situated between the barge and S2/S3, was within the Action Level, the exceedances measured at S2 and S3 were unlikely to be caused by the jetting works but should be considered as representing natural background levels during the time of monitoring. Exceedances of the Action and Limit Levels in bottom DO were recorded at Stations E9 and S3 in the 1st and 2nd sampling rounds on 10 October 2012 (Table 4.4). According to the daily barge operation report, the Contractor did not conduct any jetting works until 15:00 due to unfavourable weather conditions on that day. Between 13:00 – 15:00, there were preparation and equipment maintenance works carried out before the burial operation (ie jetting works) resumed. Cable laying works stopped at approximately 16:00 in the afternoon due to restriction to cross the Tathong Channel until 17:00 as per recommendation from the Marine Department. The actual time of jetting works on 10 Oct 2012 was between 15:00 - 16:00. Despite the Action Level exceedance at S3 in the 2nd sampling round, the bottom DO value (4.35 mg/L) was higher than that measured at the same station in the 1st round (4.25 mg/L) when jetting works had yet to start and was not expected to impose any impact. The bottom DO at S3 continued to increase and was found to be compliant with the water quality limit in the 3rd sampling round when jetting works resumed after 15:00 and were taking place at the time of sampling (15:05 - 19:03). Therefore the exceedance measured at the S3 in the 2nd round was unlikely to be caused by the jetting works but should be considered as representing natural background levels during the time of monitoring. Exceedances of the Action Level in bottom DO were recorded at Stations E9 and S3 only in the 3rd sampling round on 11 October 2012 (Table 4.5). According to the daily barge operation report, there was preparation work carried out by the Contractor before the burial operation (ie jetting works) resumed at 10:45. All marine works stopped at approximately 23:00 in the evening. The actual time of jetting works on 11 Oct 2012 was between 10:45 to 19:30 and 21:00 to 23:00. The exceedances of the Action Level at both E9 and S3 in the 3rd sampling round are occasional. The bottom DO values at these two stations increased and were found to be compliant with the water quality limit in the 4th sampling round when jetting works were still being conducted until 23:00. In addition, jetting-related oxygen depletion is expected to be caused by the release of suspended solids and its subsequent oxidative process. However in this case, depth-averaged suspended solids levels at all monitoring stations were low and in compliance with the Action and Limit Levels during all four water sampling rounds. Therefore the exceedances were unlikely to be caused by the jetting works but should be considered as reflecting natural background fluctuations during the time of monitoring. 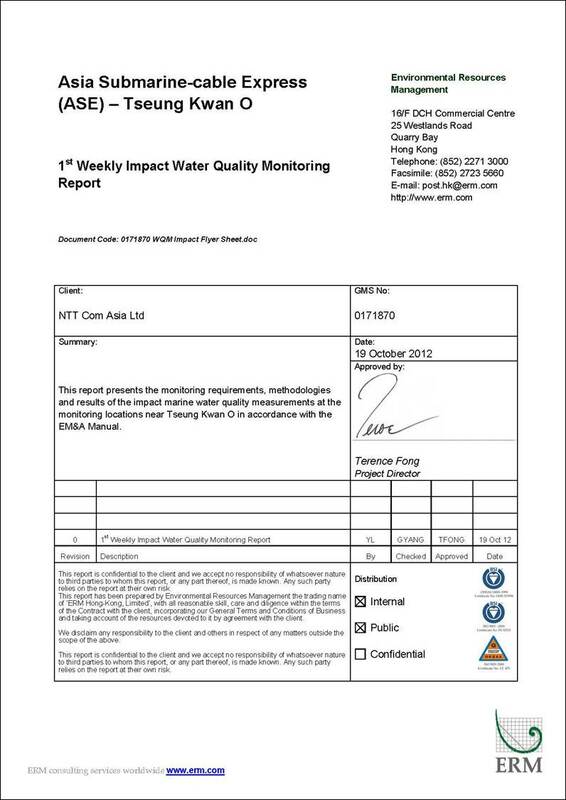 Due to technical problems, impact water quality monitoring in Zone B started around 11:00 on 13 Oct 2012. As such, a total of three rounds of water sampling were carried out for the day. Exceedances of the Action and Limit Levels in middle DO, depth-averaged Turbidity and depth-averaged SS were recorded at Stations B3, E9 and F1 in all three sampling rounds (Table 4.6). According to the daily barge operation report, there were some preparations works carried out by the Contractor before burial operation on the day. The burial operation (ie jetting works) was conducted between 10:30 to 12:00 and 13:30 to 16:30 on 13 October 2012. As stated above, jetting works were not being undertaken when the exceedance in Depth-averaged Turbidity was recorded at B3 (22:00 - 22:15) in the 3rd round of marine water quality monitoring. Therefore, the exceedance of the Action Level at B3 is considered as representing natural background fluctuations. Impact Stations E9 and F1 are located in the north, far away from the cable installation barge. It should be noted that the average values of depth-averaged Turbidity and depth-averaged SS at E9 (Turbidity = 3.68 NTU; SS = 4.29 mg/L) and F1 (Turbidity = 3.03 NTU; SS = 3.78 mg/L) on 13 October 2012 are actually of the similar magnitudes of their corresponding values (averaged values of 8 – 11 October 2012 for E9: Turbidity = 4.00 NTU, SS =4.61 mg/L; averaged values of 8 – 11 October 2012 for F1: Turbidity = 3.66 NTU, SS = 4.13 mg/L) in the previous dates or even better. When the sampling was carried out in the first round, the current direction was eastward. Given the fact that values of all water quality parameters at the Gradient Station (ie G4) and Impact Station (ie E2) in the eastern vicinity of the barge were measured to be within the corresponding Action Levels, the exceedances in middle DO, depth-averaged Turbidity and depth-averaged SS at E9 and F1 in the 1st sampling round, as well as later in the 2nd (18:44 – 19:00 for E9 and 18:03 – 18:17 for F1) and 3rd (19:02 - 19:18 for E9 and 19:44 – 19:59 for F1) rounds when jetting works ceased, were unlikely to be caused by the jetting works but should be considered as representing natural background levels during the time of monitoring. Exceedances of the Action and Limit Levels in middle DO, depth-averaged Turbidity and depth-averaged SS were recorded at Stations E9 and F1 in all four sampling rounds on 14 October 2012 (Table 4.7). According to the daily barge operation report, the burial operation (ie jetting works) was conducted between 10:00 and 16:00 on the day. Impact Stations E9 and F1 are located in the north, far away from the cable installation barge. It should be noted that the average values of depth-averaged Turbidity and depth-averaged SS at E9 (Turbidity = 3.87 NTU; SS = 4.86 mg/L) and F1 (Turbidity = 2.98 NTU; SS =4.00 mg/L) on 13 October 2012 are actually of the similar magnitudes of their corresponding values (averaged values of 8 – 11 October 2012 for E9: Turbidity = 4.00 NTU, SS =4.61 mg/L; averaged values of 8 – 11 October 2012 for F1: Turbidity = 3.66 NTU, SS = 4.13 mg/L) in the previous dates or even better. Between these two stations and the cable installation barge, there are several Gradient Stations (ie G3 and G4) and Impact Stations (ie E2, E6 and B1), which are located in the middle and therefore more susceptible to the impact of the Project. But exceedances of Action and Limit Levels in all water quality parameters were recorded at none of these stations. The fact demonstrates the exceedances in middle DO, depth-averaged Turbidity and depth-averaged SS at the E9 and F1 in the 1st and 2nd sampling rounds, as well as later in the 3rd (15:05 – 19:02) and 4th (19:05 – 23:04) rounds of marine water quality monitoring when jetting works ceased, were unlikely to be caused by the jetting works but should be considered as representing natural background levels during the time of monitoring. Exceedances of the Action and Limit Levels were recorded during the reporting period. The Event and Action Plan for the identified exceedances were implemented and followed the procedures as stipulated in the EM&A Manual and Table 3.7. It was concluded that the exceedances were considered to reflect natural background fluctuation rather than to be caused by the Project (See Section 4.2 for details). The cable installation works will be conducted in Zone C and from Zone C eastward to the boundary Hong Kong marine waters. Impact water quality monitoring will be carried out in Zone C and will cease once the cable installation barge moves out Zone C or no cable laying works are undertaken within Zone C.
This Weekly Impact Monitoring Report presents the results of impact water quality monitoring undertaken in Zone A and Zone B during the period from 8 October to 14 October 2012 in accordance with the EM&A Manual and the requirements under Environmental Permit (EP - 433/2011). Water quality of Zone A and Zone B was generally stable throughout the sampling period. Neither sudden drop in dissolved oxygen concentrations nor sharp increase in turbidity levels and suspended solid levels were observed. Exceedances of Action and Limit Levels were recorded during the reporting week, but they were considered to reflect natural background fluctuation rather than to be caused by the Project. It is concluded that no deterioration of water quality was observed and hence the effect of the Project on water quality is considered to be negligible.